When twelve-year-old Nick runs away from his uncle’s in the middle of a blizzard, he stumbles onto a very opinionated bookstore. He also meets its guardian, the self-proclaimed Evil Wizard Smallbone, who calls Nick his apprentice and won’t let him leave, but won’t teach him magic, either. It’s a good thing the bookstore takes Nick’s magical education in hand, because Smallbone’s nemesis—the Evil Wizard Fidelou—and his pack of shape-shifting bikers are howling at the borders. Smallbone might call himself evil, but compared to Fidelou, he’s practically a puppy. And he can’t handle Fidelou alone. Wildly funny and cozily heartfelt, Delia Sherman’s latest is an eccentric fantasy adventure featuring dueling wizards, enchanted animals, and one stray boy. Delia Sherman is the author of numerous books and short stories for adults and children, including The Freedom Maze and “The Ghost of Cwmlech Manor” in Steampunk! An Anthology of Fantastically Rich and Strange Stories. She also enjoys teaching writing workshops. Delia Sherman lives in New York City with her wife. Sherman captures perfectly the slow transition of a kid steeped in grief and misery to a boy who is slowly starting to trust, love, and hope again, and it’s endearing to see Smallbone evolve as well. Fans of McCoola’s recent graphic novel Baba Yaga’s Assistant (BCCB 10/15), which cleverly looked at one girl’s quest to join up with a threatening individual, will appreciate this similar and equally splendid tale featuring Nick and his wizard. Though Fidelou and his crew of biker werewolf minions add some dramatic distraction, it is Nick's evolution into a young wizard that commands attention. Readers journey with Nick as he stumbles through what was real in his world, his grief at losing his mother, into a magical world that gives him a sense of purpose. Fans of fantasy will be captivated—and hoping for a sequel. Avid readers will enjoy Sherman’s nods to other literary works, and reluctant readers will find themselves immersed in the tale. Recommended for fans of Harry Potter, this story will captivate older readers while remaining accessible to younger ones. Recommended as a first purchase. Much of the story’s momentum comes from Nick’s efforts to teach himself magic as he grows along the way from a snarky and self-interested character into someone who takes responsibility for others, including Smallbone’s previous apprentices. Well-timed revelations about the townspeople’s origins also feed the ongoing mystery...by the end, even this is resolved, in a way that will satisfy wizardly apprentices and readers alike. 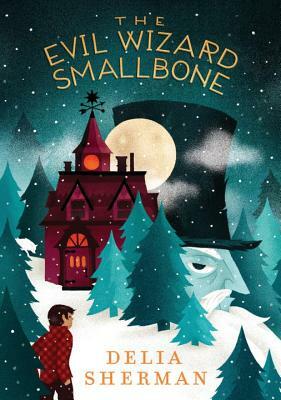 In her entertaining modern-day fantasy set in Maine, Delia Sherman (Changeling; The Freedom Maze) examines whether an evil wizard can also be good; the qualities necessary for success; and the importance of writing one's own story...The Evil Wizard Smallbone is a terrific middle-grade fantasy from a skillful, witty, always-inventive storyteller. Readers will be hooked early on with the numerous spells, enchanted animals, dueling wizards, and constant action in this fantasy tale. A couple plot twists add to the action. In an imaginative contemporary landscape of magical pelts and powerful tomes, Sherman (The Freedom Maze) delivers a cast of richly developed characters...Themes that include the importance of self-confidence and self-knowledge, as well as the power of appearances and of reading, should resonate with a broad range of readers. This is an unassuming but very smart story of created family and dedication to duty, laced with prickly warmth and humor and populated by people that you wish lived next door...The story is never dull and would make a good read-aloud. Try this with fans of Angie Sage’s Septimus Heap series or Susannah Appelbaum’s Caux books.